Nursing Badges - The London Hospital. The history - Evolution and Identity. The London Hospital Badge: History, Evolution and Identity. Last year, having seen several for sale on eBay and being the proud owner of my own London hospital badge, I became more interested in the history behind the badge - in the sizing, when they were first issued, and if possible how many were made and issued. Like many hospitals, the London did not have a badge until the 1920's. 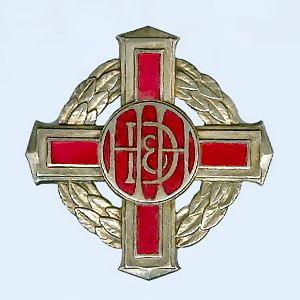 In 1928 Miss Irene Paulin (daughter of Sir William Paulin - honorary treasurer to the London Hospital) and a member of the hospital nursing committee, approached John Pinches (1) (head of Pinches and co, (bought out by Franklin Mint in 1969 )) and asked him to design a badge for the trained nurses of the London - insisting "that the badge be comparable with those of other London Hospitals." 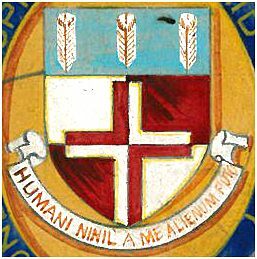 The London hospital had no coat of arms at that point in time, and it was decided that the nursing committee would postpone their decision until a coat of arms was granted. Eventually the London hospital coat of arms was designed by the garter principal king of arms, the Richmond herald Sir Gerald Woods Wollaston. The first large style badge was made and presented to Queen Mary, at that time president of the hospital, and it is documented that she wore it on every visit. It was originally intended for League members only, (1) the league having been established in 1931. (We celebrated the 80th anniversary with a lunch in the old medical college in September 2011). By the league review publication number 2, (November 1932), there was already controversy about the size and weight of the badge (1) and reports that it ripped the starched aprons, because of its size. (These records are as yet elusive - Franklin mint reduced their records in 2004, and Fattorinis (who made the later badges including mine) only have records from the 1980's - 1990's. They told me that the badges made then were 35mm. What is incontestable is the fact that the earlier, larger badge weighed 32 grams - over an ounce - and had an extremely well engineered pin and extremely sharp pin of over 47mm. Whilst the pin had secure fastenings it did protrude around 3mm. Long enough, perhaps, to be seen as potentially dangerous. Fig3. London Hospital Badge set. The later design weighed 18 grams and was only 34mm wide, and whilst the pin was still well engineered and still sharp it did not protrude. It could be considered a much safer design. The badge was otherwise unchanged. A superb example of craftsmanship. 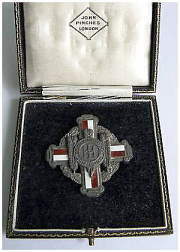 The issue of the larger badge ceased about 1933 and issue of the smaller badge commenced no later than 1934. It is assumed that the badge-boxes illustrated below in Figs 5 - 7 was also changed around that time, although when the final change to the Fattorini-type small plastic box occurred is not yet clear. It seems fair to assume that the latter occurred when Fattorini's took over the manufacture of the London Hospital badge, as both the badges and boxes had previously been made by John Pinches. Elements of the London hospital badge can be seen in that of the Haslemere and district hospital - where a tutor was a Londoner, and similarly the badge of the Derbyshire sick children's hospital has familiar elements - to us "Londoners". (1) ( I am awaiting permission and an image from Derbyshire Records Office - They may not allow me to include it in this article and will charge). 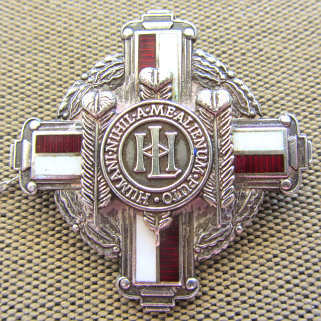 There are also similarities between both the Haslemere badge and that of the West Park Hospital Badge, which has a blue cross with wreath around the edge. I have not yet researched to see if there is any connection. It would make an interesting study to trace the matrons of the hospitals of the nation in the period of Florence Nightingale/ Eva Lückes and others who trained at the "big" London Hospitals and were recruited in the "provinces" to establish training schools and good nursing care. On my brief perusal of several copies of Burdetts (5) it was clear that many matrons nationally originated as nurses from London Hospitals. One such nurse who I have started to research was Mary E Pinsent, who became a matron of the Royal National Orthopaedic Hospital in Hanover Square - as it happens also a "Londoner". There is such a list for "Nightingales" on their league web site. Likewise, the change in the design of the boxes followed the downsizing of the badges. The original (older version) box being 182mm square and weighing 48 grams whilst the later box was only 163mm square and weighted 42 grams. The very high quality of both badges and boxes was retained during the years of production by John Pinches, although the presentation boxes were changed dramatically during the Fattorini years (in common with the majority of hospitals). The quality of the London Hospital badge has in most respects been maintained, if not improved upon. The hallmarking of the solid sterling silver 'badge of the three feathers', (the design relating to the original tavern where the meeting was held to found the hospital in 1740), which was absent from all earlier (pre Thos Fattorini badges) has been corrected. It was, and remains, an absolutely superb item. 1. 'History of the training school badge' Margaret Job, 1967 (Royal London Hospital Archives ref: RLHLH/NE/10/2). 2. Toye Kenning and Spencer . Figure 1. London Hospital Badge, the authors own, copyright Sarah Rogers. Figure 3. 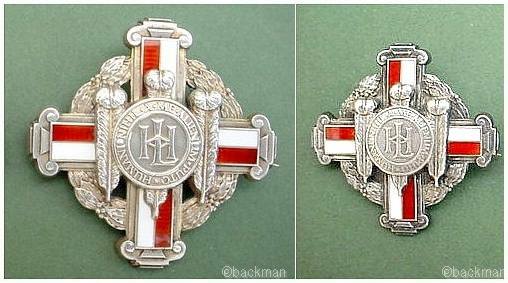 Large and small London Hospital badge set - copyright Peter 'backman'. Figure 4. Haslemere & District Hospital Badge - number 633 Royal College of Nursing Archives. * Beatrice Monk was Matron 1919 -1931.